. يقدم Airport Manor Inn خدمات لا غبار عليها وكل أشكال اللياقة وحسن الضيافة اللازمة لإسعاد ضيوفه. تتضمن الميزات الرئيسية في هذا الفندق: واي فاي مجاني في جميع الغرف, محطة شحن السيارات الكهربائية, متجر, خدمة التنظيف يوميًا, مدفأة. تتضمن كل غرف النزلاء وسائل الراحة والتسلية المصممة خصيصاً لضمان الراحة القصوى للضيوف. صممت خدمات الاستجمام في الفندق والتي تتضمن مسار جولف - ضمن 3 كم, سبا لمساعدتك على الاسترخاء والراحة. إن Airport Manor Inn هو خيارك لخدمة الفنادق الراقية في أوكلاند. غرفة توأم مع حمّام سبا. The tub was wonderful, jets powerful and relaxing after a flight. Was in a nice quiet district and there was a nice fruit and veg store and lunch and breakfast cafe on the opposite side of the road just ten minutes short walk away. Would probably stay there again when waiting to fly back to North America. Shuttle service to and from airport very good. It would be good to include wifi password in the ‘Guest Information’ for those arriving after office hours. We had no shower only a spa bath which we had no time to use as we arrived late and left early. The property is good for those who need a place to stay in between flights. They provide a free shuttle to and from the airport. The receptionist at that time, Naomi, was kind enough to lend me an umbrella. The Mangere Town Centre is close enough for you to walk to if you're looking for food. This property is NOT close to the city but is close enough to the airport. We stayed at this Motel prior to departure & on return. While it is perhaps a little basic it is certainly very adequate for our purposes. It is clean & tidy , the staff are friendly & the airport drop off & pick up service is excellent. A big plus for us was that on our return from Fiji on a cool evening, the heater in our unit had been turned on for us. Great service! All this at a reasonable price. What more can you want? We stayed two nights and were very impressed with how clean the room was and that the room was restocked and cleaned after the first night. We will definitely be staying here again. The shuttle service and free parking is also something we will use next time we travel overseas. complimentary airport pickup to motel great. Great staff, helpfull and accomodating to late check ins. Though the motel gave us what we want, i.e. parking space in front of our room, and free wifi, but it the facilities are dated, and no heating in toilet. We missed the entrance and had to turn big round because of the road contruction in front of the motel ( in late April). The location is great. It's close to the airport , supermarket and petrol station. The staff is helpful. The motel is comfortable, quiet and clean. We had a great stay at the motel. The room was comfortable, quiet and clean. 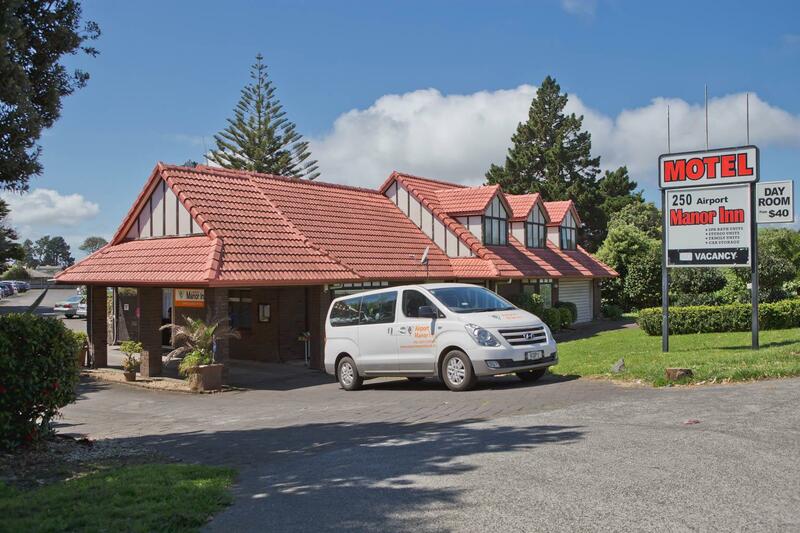 The motel was conveniently located near the airport, Pak n Save Supermarket and petrol station. The staff was also helpful. We were picked up from the airport in 15 minutes after calling them at 3 in the morning. The motel had all the basic necessities for a good stay. We wouldn't mind going back there to stay again. Comfortable stay for a family of 4 adults and 2 children although the kitchen a little close to the beds. Noise level of traffic low. Prompt free pickup service. Had to rate food which we did not have as there was no N/A space. I would stay again. Staff pleasant. I have stayed at Manor Inn many times over the years and the standard has slipped. Very little provision of coffee etc even for one person, very cold on arrival...I had the heater on most of the night to warm the place up. The floor in the shower area is very cold and obviously is set without insulation from the ground and the rooms have a very high ceiling which does not help. The location is excellent for me but I will shop around on my next trip. Had no hot water & was told I had to shower in someone else’s room. I said no & wanted a refund. They refused. After several disagreements back & forth, I videoed the manager with my phone. She snatched my phone & ran into the office, I managed to get into the office & was met by her husband who forcefully held me back while she was trying to delete the video. I was screaming for help. Was completely appalled at this. I paid $150 to be assaulted. The police were called. I will never stay there again & wouldn’t recommend it to anyone else!!! Very noisy in the early hours from travellers arriving and leaving. Pick up and drop off service was great, particularly the husband and wife drivers, super friendly and helpful. Room was clean and quiet & very handy to the airport.